Underwater, or deep sea diving is a popular recreational sport, and is also necessary for underwater rescue, salvage, and repair operations. Such activities often require diving to great depths in very cold water. Even in warm climates, the ocean can be very cold at great depths. For protection from such temperatures and the prevention of hypothermia, underwater divers wear diving suits, which keep them warm by preserving their body heat. By way of example, an unclothed diver entering water cooled to 50° F (10° C) would only survive in such temperatures for approximately 3.5 hours. A diver wearing a diving suit would survive for approximately 24 hours in water of the same temperature. There are two basic classifications of diving suits: the helmet suit, which completely encloses the diver and contains a breathing apparatus that fits over the head, and the scuba suit, also known as the free-diving suit. Scuba is an acronym for Self-Contained Underwater Breathing Apparatus. The Scuba suit is used in tandem with an independent breathing apparatus strapped to the diver's back. There are two types of scuba suits. The dry suit keeps the diver completely dry; a diver can even wear clothes under a dry suit. The wet suit, on the other hand, holds a thin layer of water between the body of the diver and the suit. This water is warmed by the body and serves as insulation, along with the suit, against cold water. The concept of underwater diving evolved with the invention of the diving bell, a large, bell-shaped chamber into which air was pumped from above surface and in which a diver could be transported below water. Early diving bells were made from openended metal-rimmed wooden barrels. This invention dates back to antiquity and may have been used by Alexander the Great. Aristotle also tells of the existence of such an invention. In 1665, a diving bell was engaged on a gun salvaging mission to a shipwrecked Armada vessel. English astronomer Edmund Halley is credited with devising the first modern diving bell in the early 1700s. Halley's bell utilizing lead containers filled with fresh air that were lowered to the bell from the surface in order to replenish the air. Halley later developed a helmet that allowed the diver to leave the bell while remaining attached to the air supply system. Toward the end of the century, British engineer John Smeaton incorporated an air pump into the diving bell's design, allowing for a constant supply of fresh air. Later bells were sealed with glass at the bottom. Bells are still used today and can carry up to four divers. They can travel to depths of 1,000 ft (304.8 m). It also has been recorded that an Egyptian diver named Issa developed a breathing machine for use during the wars between the Crusaders and the Saracen in the twelfth century. Issa's breathing machine included a bellows and allowed him to remain under water for long periods of time. He kept him-self just below the water's surface by tying stones to his belt. Six centuries later, John Lethbridge of Devon created a six-foot-long diving tube. The tube was designed to allow Lethbridge to lay horizontally inside of it with his arms protruding from the apparatus. Air was pumped in from above water using bellows. Lethbridge stayed underwater inside his apparatus for up to six hours at a time, and was contracted to salvage treasure hulks from underwater areas across the world. The helmet suit is a variation on this invention and functions as a portable diving bell. Like the diving bell, air is pumped into the helmet from above the water's surface. The suit itself is composed of rubberized fabric. The diver enters the suit through a hold in the neck. The helmet is attached to the suit with a waterproof seal. The air is pumped into the helmet, which has glass ports for vision, at the pressure of the surrounding water. This is known as ambient pressure. Expired air is expelled through an outlet valve. A line is attached to the suit, which allows the diver to be hoisted to the surface. Modern helmet suits are also typically equipped with a telephone line, allowing the diver to maintain voice contact with people above the water. While the helmet suit allows a diver to stay underwater for long periods, due to the constant supply of air, it does not allow for much mobility. Free-diving, or scuba, suits, on the other hand, are variations on this innovation that allow for increased mobility. They are used in conjunction with fins for the diver's feet, a diving mask, and the independent breathing apparatus, known as an aqualung. The dry suit is loose fitting, allowing for clothing to be worn underneath it, and equipped with waterproof seals at the neck, wrists and, on some, the waist. The dry suit traps air, however, and that air is compressed as the diver swims deeper and the volume of air decreases. This compression makes the suit rigid and inhibits the diver's movement. In addition, the diver's skin can get caught and pinched in the folds of the suit, causing welts. The wet suit, therefore, is preferable in many situations. The dry suit, however, is better suited to extremely cold water temperatures as it allows the diver to wear warm, dry clothing under-neath. It is also more protective from elements, which makes it more desirable in polluted water. Disinfectant can also be poured over the dry suit. The wet suit was adapted from the dry suit and is made from close-fitting, foam rubber-like material. The wet suit is not water tight. Rather, water seeps into and under the suit and is trapped between the suit and the diver's skin. The diver's skin warms the water, and the water acts as a second layer of insulation, with the foam-like substance, which traps air bubbles, providing the first. Warm water may also be poured into the suit before the dive takes place. A disadvantage of the wet suit is that the air bubbles cause buoyancy, requiring the diver to wear a weighted belt. As the diver descends, the ambient pressure shrinks each air bubble, resulting in a loss of both buoyancy and insulation. Thus, the diver becomes much heavier. Products that help compensate for this loss of buoyancy include an adjustable buoyancy life jacket, which is affixed to a cylinder of compressed air. As the diver descends, he or she can let air into the jacket to increase buoyancy, and on ascending the air can be released. A significantly more expensive wet suit utilizes air-filled gas bubbles, rather than the foam bubbles, to help maintain buoyancy. Recent innovations in diving suit technology include a hot water suit. This sealed suit is provided with hot water from above the surface. The hot water flows through a series of passageways in the suit and exits through valves, to allow for a constant flow of hot water. This suit is commonly used in saturation diving, where the diver breathes a mixture of helium and oxygen. Helium conducts heat faster than air, so a diver breathing this mixture is at greater risk of hypothermia. In the 1970s, as companies seeking oil below the ocean floor desired to dig their wells even deeper, an old technology was resurrected for divers who repaired the wells. In the 1920s, an engineer named Joseph Peress designed an atmospheric diving suit (ADS), a massive-sized apparatus that allowed a diver to breathe air at normal atmospheric pressure. Peress had used his early ADS to seek shipwrecks in the 1930s and tried to market it to the Royal Navy, which had no use for it. Peress' early ADS was made from cast magnesium and plexiglass, coated with waterproof sealant. A cushioned ball-and-socket joint system allowed the diver relative freedom of movement. An ADS can carry enough air to last 72 hours. Today, the ADS is made from welded aluminum or glass fiber. After mixing neoprene with several additives, the liquid is baked in loaf-like shapes. Once baked, the material is sliced into preset widths. The primary raw material used in the making of a wet suit is a type of sponge rubber known as neoprene. The dry suit utilizes a rubberized fabric. Some metal is also used for zippers. The manufacturing process for both types the wet and dry scuba suits is similar. Both are constructed in assembly-line fashion. 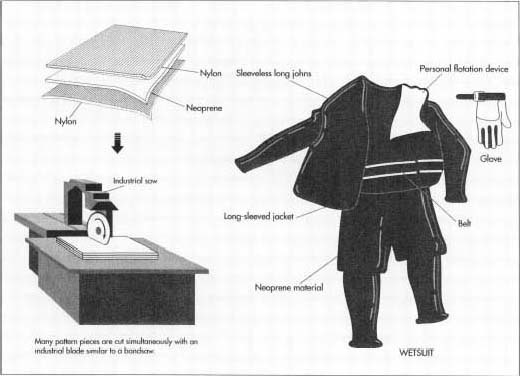 Here, the process for the manufacture of the wet suit is outlined. The neoprene arrives at the factory in liquid form. The manufacturer adds additives to the liquid and it is mixed with an industrial-sized mixer. Next, the liquid is baked in a large oven. The baked product measures about two feet tall and resembles a huge loaf of rubber bread. The baked rubber is allowed to cool. The sheets of rubber, each about the size of a sheet of plywood, are then placed on a conveyor belt where they are lifted and sprayed with glue. 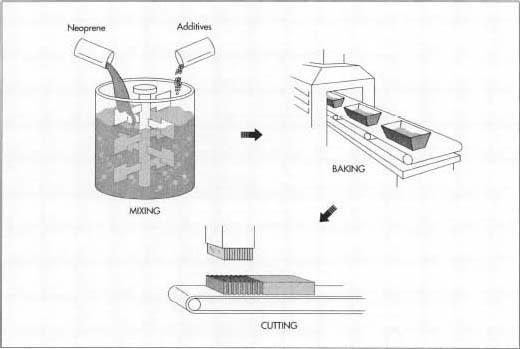 The sheets of rubber are laminated with a form of nylon that is squeezed onto the rubber. The laminated nylon is then allowed to dry. Once dry, the nylon-bonded rubber becomes stretchy. The rubber is then inspected and divided up by grade, or thickness. The nylon-neoprene-nylon layered material is cut into pattern pieces and the wet suit is sewn. The sorted rubber is loaded onto a palette and sent to the wet suit makers. The wet suit maker stretches a stack of rubber about 10-15 sheets high and lays a pattern over the top. The pattern is traced with a white crayon. A sawing machine cuts suit panels out of the stacks of rubber, following the crayoned-on pattern. Dry suits are hand-cut. The suit panels are sent to the decal department, where decals are adhered using a heat press. Next, the panels are sent to the zipper department where zippers, pockets, kneepads, and flatwork are sewn or pressed on. The panels are then sent to the gluing department, where each panel is coated with neoprene cement. The open sides of the front and back panels are glued together and arms and legs are attached to the body of the suit. The suits are sent to the final sewing area, where nylon thread is used to stitch the seams of the suit. The suit is cleaned and inspected for quality and tags are adhered using stitching or a hot press. Most quality control for diving suits is conducted along various stages of the manufacturing process and/or at the end of the line. Finished suits may also be spot-tested for durability and water resiliency. Diving suit designs have changed fairly little over time. New colors and styles of suits and the patches and logos applied on them occur on the market regularly, and small design alterations may be made to established designs to improve comfort or enhance durability and/or water resiliency. New technology is always being explored, such as that which led to the creation of the hot water suit. The diving suit has also gone high-tech, with the utilization of the ADS, and it is likely further technological advances will lead to updates and alterations of that product. Clinton, Larry. The Complete Outfitting and Source Book for Sport Diving. Henry Holt, 1979. Desiderati, Barbara M. Pictorial History of Diving. Best Publishing Co., 1988. Farley, Michael B. Scuba Equipment Care and Maintenance. Marcor Publishing, 1980.